We focus on solutions, transferring our experience into the financial area. In our office we attend the different types of business lines that the company demands. 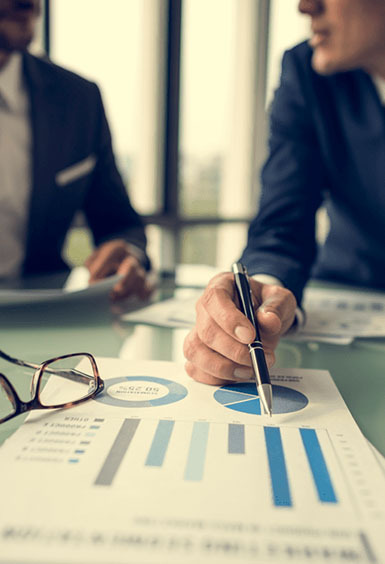 We actively advise our clients in mergers, splits, acquisitions of companies, sales of business units with the appropriate confidentiality required by these operations, establishing tools and valuation methodologies to define the final price of transactions. With the aim of helping our clients to improve the performance of their management and the economic-financial control of their business, we provide financial consulting services, which offers them the possibility of optimizing their resources as well as reinforcing the main lines of their business. Taxation, Commercial, Bankruptcy, Valuation of companies, acquisitions, mergers, splits and transformations of companies, liquidations and dissolutions of companies, Accountant, Due-Diligence, Implementation of internal control system procedures, strategic plans, viability plans, preparation of bankruptcy proceedings, creation of audit committees, family business protocols, quality audits (ISO certification) and implementation of management and control systems for promoters and building companies. Financial consulting services. For every need, a solution. Auxiliary delegates in creditors’ competitions. Business reviews for financial entities.